The flexibility of the netting structure minimises the possibility of falling objects by spreading the impact of the load consistently across the system. Our netting comes in a range of colours, sizes and strengths and is easy to install. 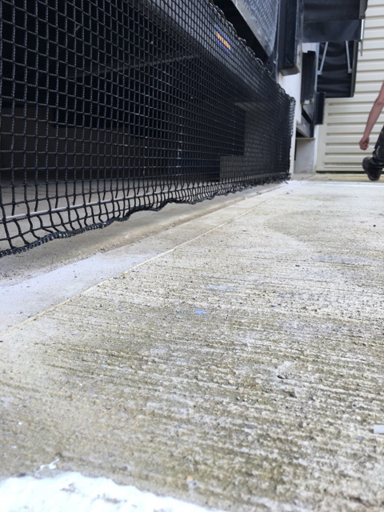 The polypropylene mesh can be put up and taken down quickly as required making it a cost effective alternative to a steel mesh system which is prone to erosion and damage. Rack & Shelf Labels (UK) Limited’s Warehouse Netting system is tailor- made specifically to the size requirements of the project. This means that the netting comes complete with all of the required fixing tools and there is no cutting or alteration needed on site reducing the installation time and impact on the operation. Warehouse Netting from Rack & Shelf Labels (UK) Limited should always be used alongside a Safe System of Work and as part of an appropriate risk assessment. For further information about Warehouse Netting please call our office on 01925 812817.